Prairie Meadows is a one mile dirt oval, located in Altoona, a few miles from the state capitol of Des Moines. It is a glass enclosed facility which features casino gambling. There is seating for 7,000 and parking for 3,600 cars. The clubhouse includes The Champions Restaurant. The track can accommodate 1,400 horses. Prairie Meadows is the only horse racing facility in Iowa. It is a Racino format that features separate meets for thoroughbreds and standardbreds. The flat runners have a purse value of 33 which should provide better scale racing. Dog racing in Iowa which was listed as the main reason for the collapse of Aksarben across the river in Nebraska may itself collapsed making Prairie Meadows the only game for miles around. Prairie Meadows is Prairie Meadows debuted during a snowstorm in March of 1989. The Jockey who won the first race, Cindy Springman was a native of Iowa. Things were a little rocky in the beginning, after only two seasons Prairie Meadows filed for bankruptcy in 1991. Racing was able to return in 1993, and in 1994 Iowa authorized slot machines ad it was all good from there! 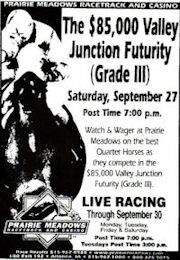 n 2011 Prairie Meadows ran three separate meets, thoroughbred, quarter horse and standardbred. Terry Thompson was the leading thoroughbred jockey, while Stormy Smith led the quarter horse colony. Nick Roland closed out the season leading the harness drivers. Racing returns to Iowa for another year in 2012. I've have made that drive on I-80 and did stop in at Prairie Meadows, again it was off season and I only got to play a little in the casino, but did get a good look at the place. It's a beautiful facility, well maintained, hopefully I can do some live racing there some day.